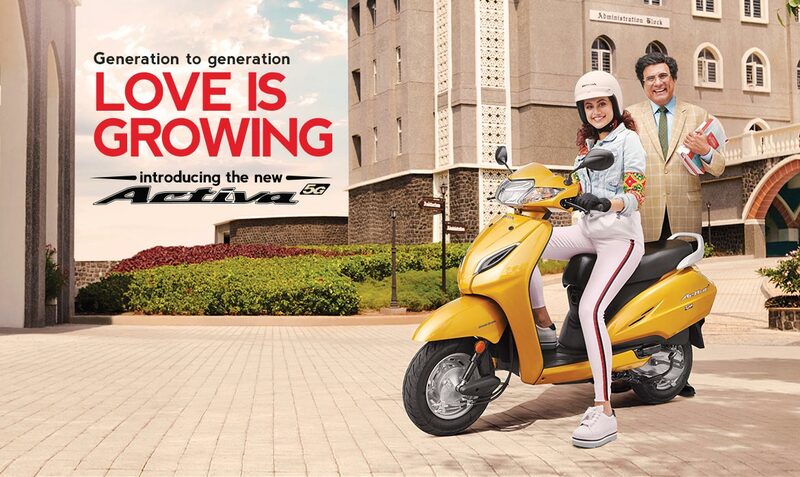 It all started a couple of years ago when Honda launched its very first Honda Activa. Also known as the people’s commuter the Honda Activa gained a lot of confidence among the general public while considering its overall performance and its user friendly nature. The Honda Activa gained popularity though it’s multiple features which mainly included a heavy storage facility, advanced engine, modern aesthetics and elevated performance on the road. The Activa was widely used by major population living especially in the urban areas for carrying heavy articles and for commuting over long distances. All the roads in our country are completely filled with unexpected obstacles and it becomes very important to keep an eye on every pothole to stay away from any possible dangerous accidents. We are always; try to fit in a maximum amount of things into a limited amount of space. This adds on the difficulty to commute through the very busy streets of any city in our country. We are all aware of the rising pollution throughout our ever growing cities. With the rise in the number of cars that are owned publicly and privately, there is hardly any space left to move freely or breathe easily. The ever-increasing traffic consists of vehicles of varied sizes. From two-wheelers and bikes to big trucks and heavy vehicles, each and every vehicle adds a generous amount of toxic to the increasing pollution. The notion of freedom is like a free road and you have absolutely no restrictions as you are free to go anywhere and do whatever on this planet. Freedom or independence is like a blessing that any individual seeks and wants to cherish every time. Freedom gives the ultimate power to conquer whatever you want by using the most of what you have. After a heavy pouring, all the busy roads throughout the big cities are completely wet and slippery and hence add to the difficulty while riding on them. Apart from just being slippery, these roads are filled with chaos as well as unexpected oil spills. Imagine this, you are speeding on a not so empty main road with a speed of 50-60 KMPH and suddenly a dog comes in your way and you lose control. Can you imagine the scenario? What does authorized servicing mean to you when you think of servicing your precious bike? Before answering that, picture this - it’s raining heavily and you are cruising through the city desperate to reach your home as soon as possible and suddenly your bike breaks down! What a disaster right! And then you have to drag the bike your way home all drenched! Well, you can avoid all of this mess by getting your dear bike serviced at Authorized service stations. Monsoon is just around the corner and the weather looks perfectly fine for a new adventure. With the ever increasing lush green lands around the periphery of the city, the monsoon seems to be the best possible gateway from your hectic schedule. A perfect combination of your favorite Honda bike and an endless adventure is what every biker dreams of while embarking on a new journey. The outskirts of the city are completely equipped with the best possible locations you can hit this weekend. With the new trend emerging amongst the youngsters, nowadays more and more bike enthusiasts are inclined towards a new generation of motorcycles which are not too sporty yet not too simple. Among all types of motorcycles, the most preferred one is the naked sporty one with a sleek design, less bulky, faster and much more elegant and sporty aesthetics. Riding your two-wheeler at night is totally different from riding during the day. Riding on the road is always open to a lot of uninvited obstacles which may include dangerous potholes or wild animals. One should always consider all the potential threats that a rider may confront while riding at night. It also adds to the overall visibility issues that arise while riding in general. Taking care of your vehicle is the most crucial element for a daily commuter. Looking after your vehicle regularly is very important so as to avoid any mishaps. A well maintained vehicle will always make your journey much safer as well as trouble-free. A well maintained vehicle will always give you the best results by supporting you on challenging rocky trails. Today, there are a lot of variants and new models in the scooter and bike segments hence it becomes very difficult to make the right decision. You have a plethora of options but, this is where the problem arises. Some scooters look identical, some have the same displacement and some have the same price. But where there is choice, there is confusion. While buying a commuter scooter or a bike, one should always consider buying a perfect fit for oneself, because the vehicle isn’t an FMCG product.